This one is a Goody. It’s very rare that I would get really excited about a salad, I mean lets be real here, I don’t know many people that look forward to salads unless you are totally virtuous like Deliciously Ella (I wish! She’s my idol), I however am not. Plain and simple I love TRYING to be Healthy and do my best but at the end of the day I’m only human!……… that was until I found this beautiful combo…….. Cue the SUPERFOOD SALAD!! I promise you that it is Super tasty, Super easy and very filling! Yes, even carnivores enjoy this one as it can be paired beautifully with roasted chicken. 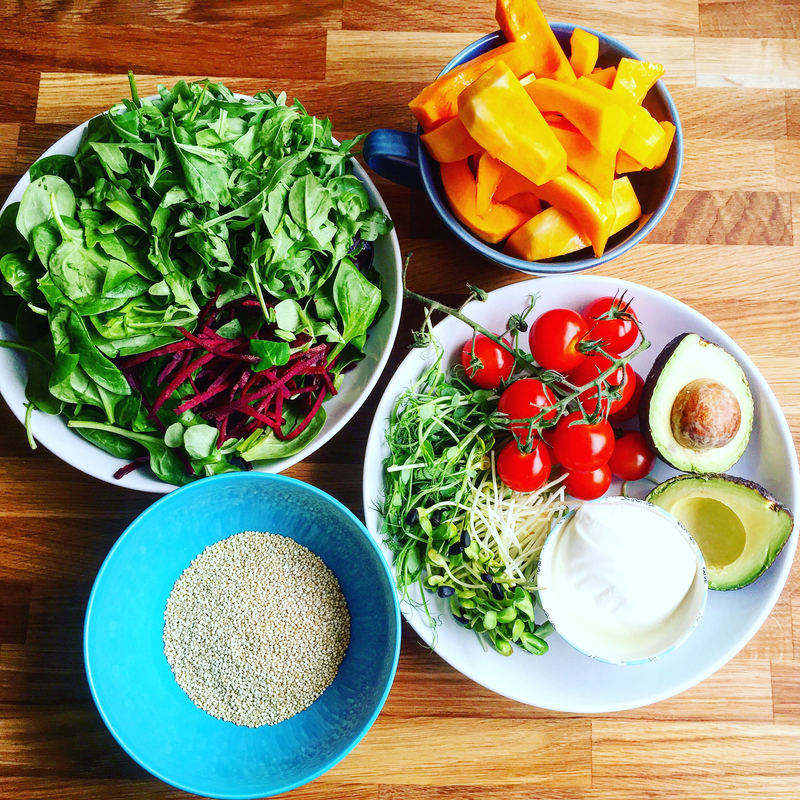 So what’s so super about a superfood salad? Well….. it’s high in anti-inflammatory phytonutrients, it contains one of the most protein-rich foods we can eat as it has all nine essential amino acids. Its jam packed with Fibre, Iron, Lysine, Magnesium, Riboflavin and Manganese…….And that’s just the QUINOA!! Then add a load of Vitamins like Vitamin A, K, C, B & E to the mix, et voila! There you have it a Superfood Salad!! 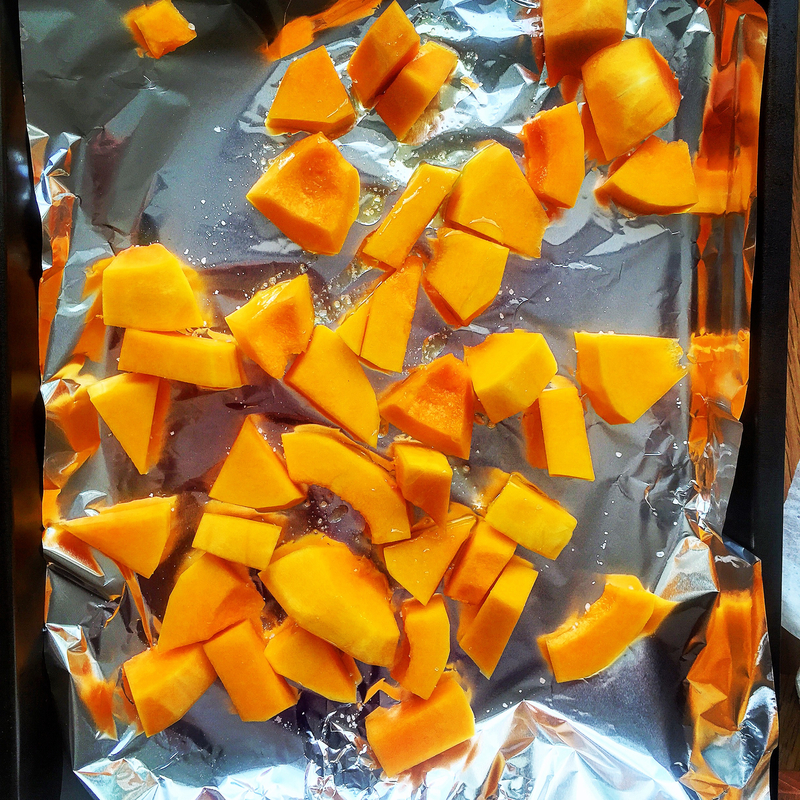 Place the chopped butternut squash on a baking tray and roast in the oven for 15 -20 mins until tender and juicy. Whilst waiting on the butternut squash to cook (pfft always taking its time! ) cook the Quinoa. Now don’t freak out here people, its very simple so just take a breath. 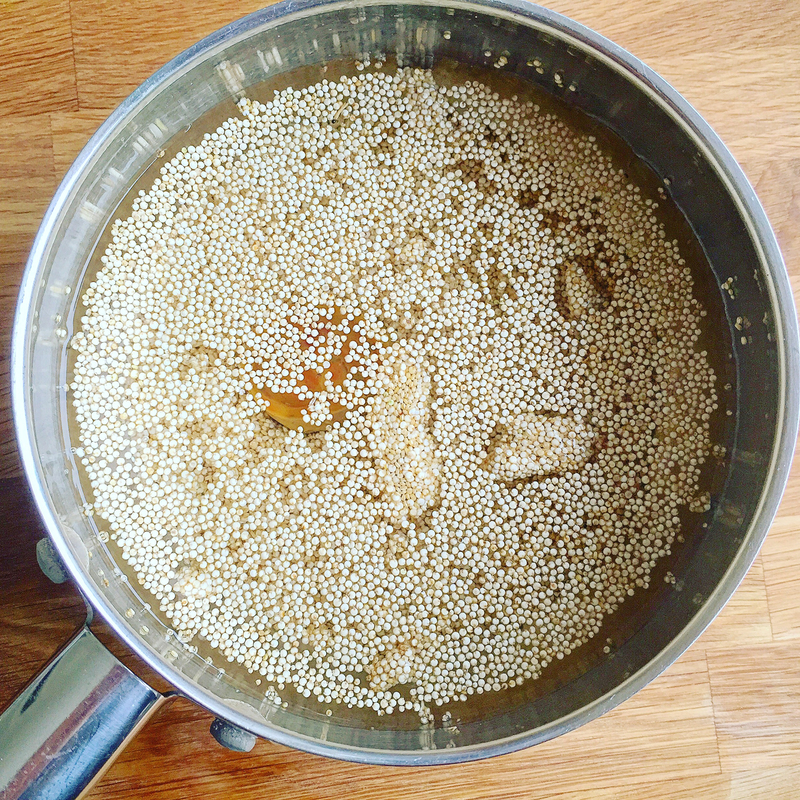 Place 1 cup of Quinoa into a saucepan with 3 cups of cold water and a veg stock cube if you have one, bring to the boil and once you see the Quinoa turning from little balls into little eyes (Just before you see the little tails hanging out) strain and leave to sit. Simples! Ok so by now the butternut squash is beautifully cooked along with your Quinoa (sure aren’t you only marvellous!) 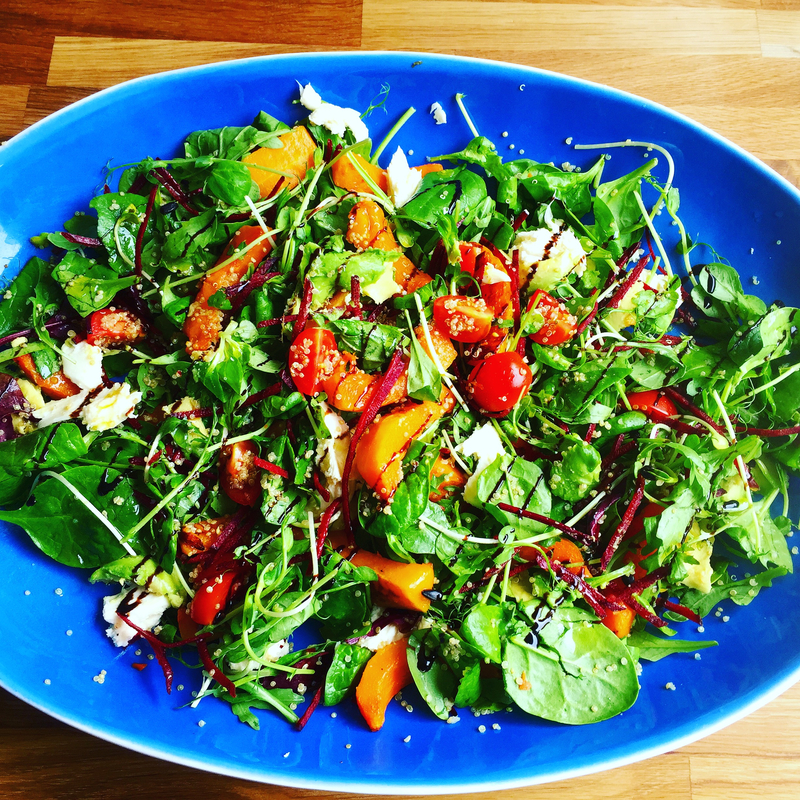 Grab a big serving dish or bowl and toss your salad leaves, Quinoa, butternut squash, chopped cherry tomatoes and pea & sunflower shoots (if using) together. Then scoop little chuncklets of avocado on top and tare the mozzarella (If using). Now here comes the cheffy part! 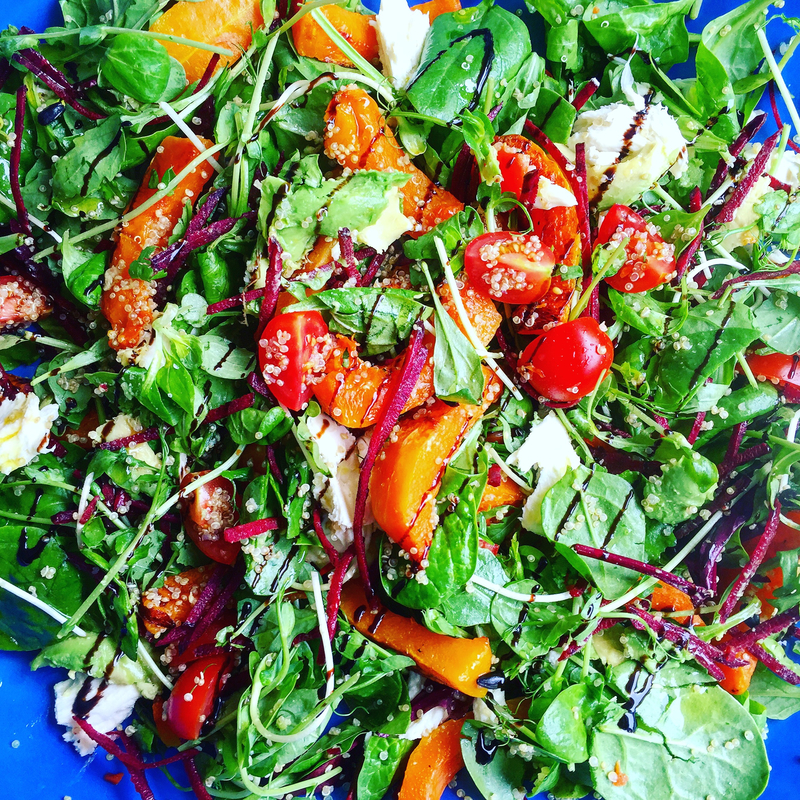 With as much flare as you can muster drizzle your salad with olive oil and balsamic glaze………. And there it is! A salad you will actually want to eat! By god you’re good! !